To nobody's surprise, Hamidou Diallo impressed in the athletic testing portion of the Combine, posting the highest max vertical leap at 44.5. That number would be the highest mark for any drafted player, although Kenny Gregory (undrafted) holds the official Combine record at 45.5 back in 2001. Diallo also posted a 3.11 in the three-quarter court sprint (third overall) and a 2.79 in the shuttle run (second overall). To compare, Zach Lavine posted a 41.5 max vertical jump and 3.19 sprint time at the 2014 Combine. 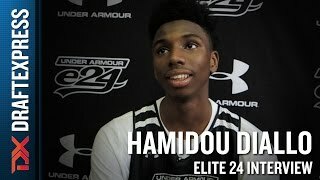 Hamidou Diallo, a 6'5 wing in the class of 2017, is one of the most athletically gifted players in his class. Diallo thrives on straight line drives to the rim, where he is capable of finishing with power or finesse. As athletic as he is, Diallo knows that his jumper needs to become a weapon instead of a liability, as evidenced by his 11/55 shooting (20%) from beyond the arc in 20 EYBL games this spring and summer.